In its first update in eight years, the AAP cites the latest research into the incidence and treatment of these injuries in the clinical report, "Sport-Related Concussion in Children and Adolescents," published in the December issue of Pediatrics. Research shows that sport-related concussion remains common in nearly all sports at all levels, with boys' tackle football and girls' soccer reporting the most incidents, followed by other high-contact sports. "While more families, physicians and coaches are aware of the health risks of a blow to the head - and more concussions are being reported - we remain concerned about players who try to tough it out without seeking help," said Mark E. Halstead, MD, FAAP, lead author of the clinical report. "We know from surveys that many high school athletes will continue to play after a head injury out of fear they won't be allowed back on the field." 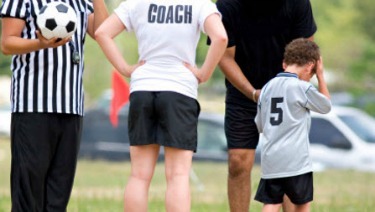 "Athletes absolutely need to take an immediate break from play after a concussion, but we find that, during the recovery process, it is best to encourage a reasonable amount of activity, such as brisk walking," said Dr. Halstead, an associate professor of pediatrics and of orthopedics at Washington University School of Medicine in St. Louis. "Students shouldn't need to take a prolonged amount of time away from school, though they should work with teachers on lessening the academic workload. These are individual decisions that families should discuss and evaluate with their child's physician." There is also no research that shows that a youth's use of electronics, such as computers, television, video games or texting, is harmful after concussion. In fact, complete elimination of electronics may lead to a child's feeling of social isolation, anxiety or depression, the report states. In girls' sports, soccer, followed by lacrosse, field hockey and basketball, carry the highest risks, according to the report. Concussions also are more likely to occur in competition than during practice for male and female athletes, except for cheerleading.